Seminar instructor, fly-tyer and pattern innovator, guide, and devoted lake-fisherman specializing in trophy-size trout, the author lives near Klamath Lake, Oregon and is considered the leading authority on stillwater fly fishing techniques. This book has won rave reviews as "the most comprehensive book available on Stillwater Presentations." 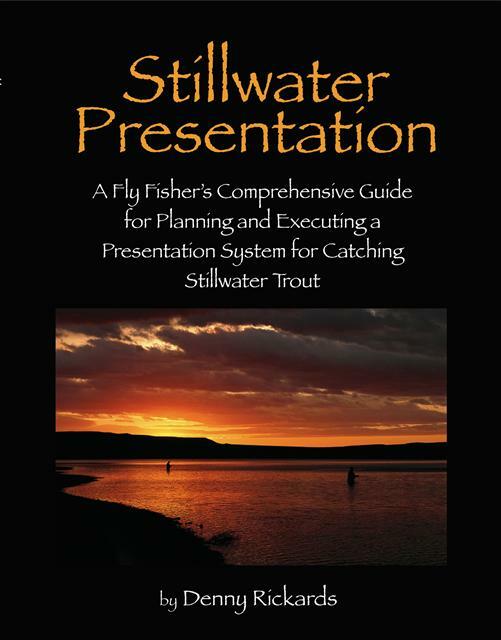 It will eliminate the mystery of tying and selecting critical stillwater fly patterns, matching tackle for specific lake habitats, depths and water quality, explain how to understand and anticipate trout behavior, and how to deliver a presentation that will re-set your bar for stillwater success, and much more. Hundreds of photos, diagrams and illustrations. Rickards' expertise and instruction will help you develop a presentation system that reliably works for trout, especially large selective, suspicious trout on stillwater everywhere. If you fly fish in lakes, ponds and reservoirs you'll wear out this incredibly detailed book and enjoy catching the largest trout of your life. Rickards is a consumate wet fly fanatic who has made a religeon out of understnading big trout in challenging situations. This is not another how-to book. This extends far beyond that. If you think you should be able to put together a presentation that nails huge trout everytime you go out, then you'll need to know what Rickards knows.